I am captivated by sculptures … all kinds. 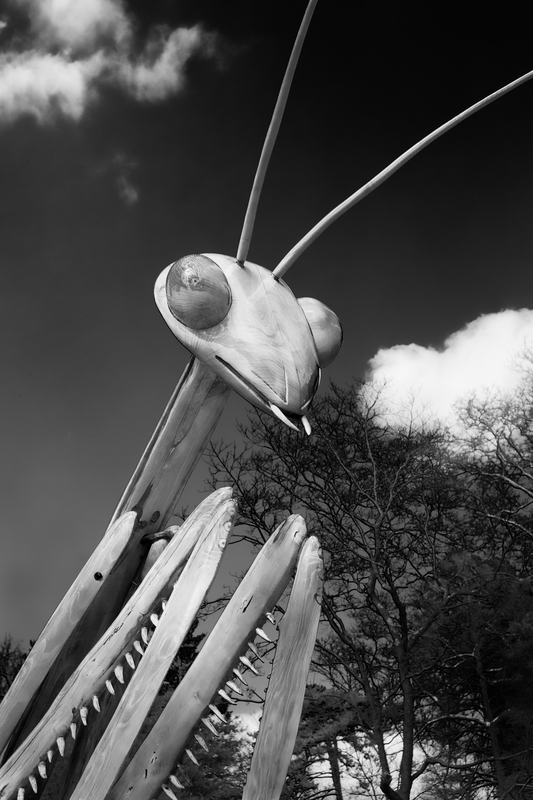 This is a giant wood sculpture of a Praying Mantis in Morris Arboretum’s (Philadelphia, PA) new “Bugs” display. I encourage anyone in the area to make a visit. My challenge for this day’s shoot was to visualize in Black and White. The Mantis’ warm brown wood tone against the bright blue sky with a couple of white puffy clouds provided the contrast that I was looking for. This entry was posted in B&W Photography, Sculptures and tagged bugs, Morris Arboretum, Philadelphia, sculptures on April 13, 2013 by kgrafphoto.